Wielding hydraulic tools like a breaker, backhoe, bucket or broom, a tool carrier can be the ultimate do-everything machine on a project site, but a tool carrier is nothing without its attachments. Compact Equipment is a magazine dedicated to tool carriers, machines like skid steers, track loaders, wheel loaders, mini excavators, telehandlers, utility vehicles and beyond, so that means we’re constantly covering the hydraulic- and PTO-powered attachments these machines utilize (from tree spades to silt fence installers). 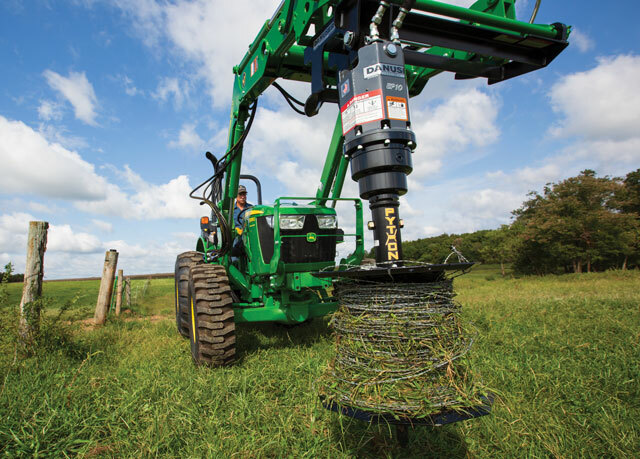 At the end of the year, we like to call out the coolest new attachments that entered the market, so here’s our list of pioneering attachments that can give your fleet a new multifaceted approach. Excavated earth is not necessarily topsoil. If you’re looking to create the latter from the former, we suggest Burly Attachments’ new Clod-Buster Topsoil Screener, a skid steer/track loader attachment for turning mountains of dirt into ready-to-grade topsoil. The bucket digs into a pile, quickly filling its three-quarter-yard scoop. Its Hardox steel agitator shreds the hard clods of dirt, allowing only the fines to pass through the screener and providing a consistent grade of topsoil at a capacity of 50 tons per hour. When the agitator rotation is reversed, you can toss rock and debris into the back of the bucket. For more info, visit burlyattachments.com. Wait. A snowplow on the back of a truck? Yep. 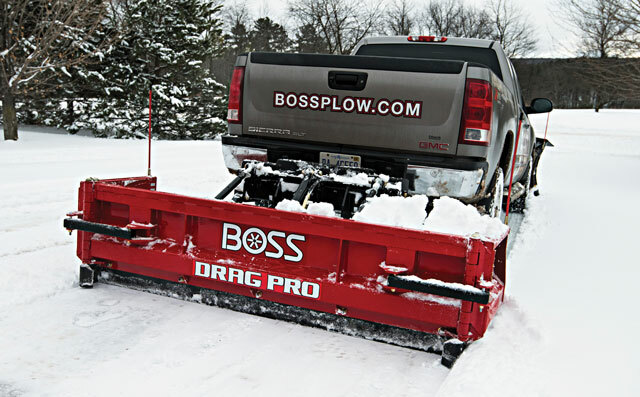 Boss Snowplow’s new Drag Pro rear-mounted snowplow aims to improve productivity and efficiency when clearing parking lots, loading bays and residential driveways, clearing snow using the back of the truck and reducing the number of passes. Available in 8-ft fixed wing, 8- to 12-ft hydraulic folding wing and 8- to 16-ft hydraulic folding wing models, the Drag Pro can open wide to maximize the area being plowed. The folding wing and fixed wing models are easily controlled via handheld controller in the truck’s cab. Boss is the first and only major manufacturer to have a product like this. For more info, visit bossplow.com. 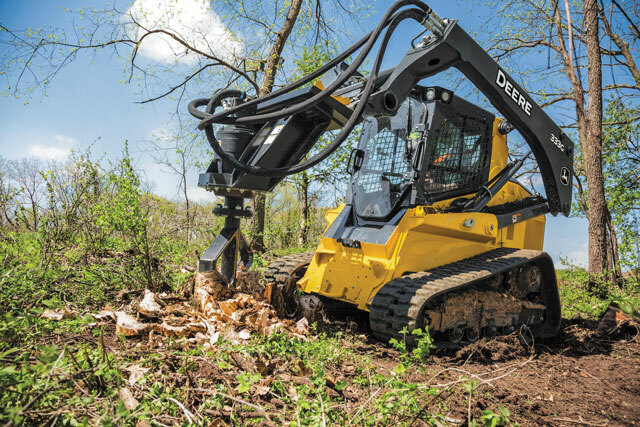 Stump removal is never an easy project, but it did recently get a lot easier for skid steer and track loader owners via John Deere’s Stump Shredder. 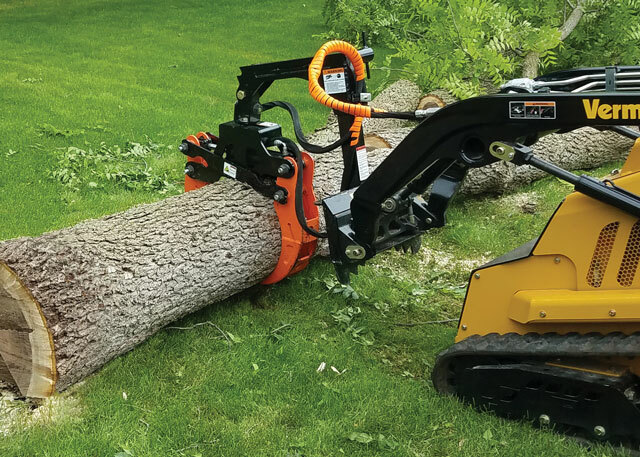 This unique attachment is designed with a low-speed, high-torque auger planetary drive that shreds tree stumps with reduced incidence of high-speed flying debris when compared to conventional stump grinders. 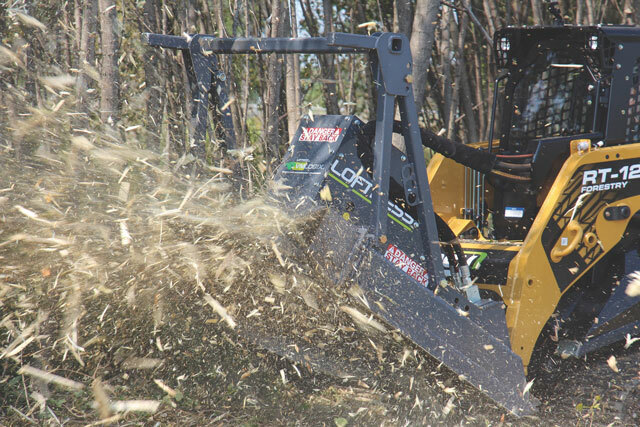 Despite its slower operating speeds, stump removal is also faster than conventional grinders. 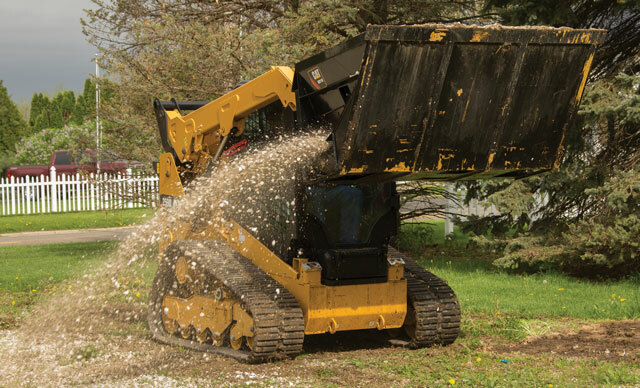 Site cleanup is easy thanks to the small, contained chip pile produced by the attachment. Carbide tool replacement parts are not needed for the attachment. For more info, visit deere.com. Salt can be equally useful and detrimental depending on where it’s spread to combat ice. Precision is important, which is why SnowEx’s Drop Pro 600 is so interesting. It has a variable-speed digital control that allows for precise adjustment of the spreader’s material feed rate, allowing the operator to only drop the amount needed for a job, saving on costs. Additionally, the drop spreader’s controlled application keeps material on the sidewalk, rather than off the path where it can kill grass. The Drop Pro 600 requires only minimal wiring for installation on UTVs, tractors and other compact vehicles. For more info, visit snowexproducts.com. Loftness already earns kudos for one of the best brand names in the attachment business. Its new Bad Ax mulcher for skid steers and track loaders also lives up to that name. First, it has dual recutter bars, so it can cut material into finer particles for faster decomposition. The recutter bar also helps avoid log jams in the chamber, which can be extremely difficult to remove. The rigid deflector provides better control of the discharge than hinged deflectors. The Bad Ax also has a fully machined disc that contains no welds, so no stress cracking. That disc has bolt-on cutting tooth mounts that can be replaced in the field. For more info, visit loftness.com. Contrary to its namesake, mini excavators can pick and place with strength and accuracy. 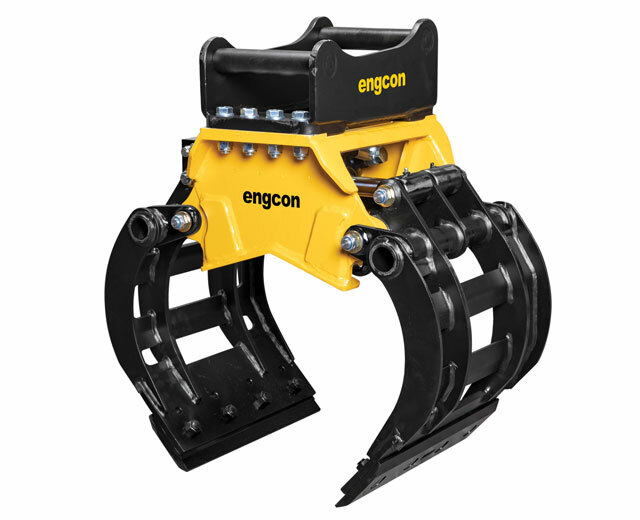 Engcon’s new SK02 Mini Sorting Grab gives small excavator operators even more dexterity. A leading manufacturer of tiltrotators, Engcon designed the SK02 to tilt, turn and rotate with a maximum grab strength of 281 lbs of force. The unit weighs 240 lbs, making it particularly suited for small excavators in the 1.5- to 3-metric-ton class. The SK02 also has screwed cutting blades, can take digging teeth and can be delivered with sealed/tight sides for use as a clamshell bucket. For more info, visit engcon.com. Unloading a bucket just got a whole lot easier. Caterpillar’s Side Discharge Buckets, designed for skid steers, track loaders and compact wheel loaders, collect and transport loose materials such as sawdust, sand, mulch and topsoil and then discharge these materials via a belt-type conveyor from adjustable openings (doors) on either side of the bucket. A rotating agitator works to keep material flowing to the conveyor. Adjusting conveyor speed and door opening controls the volume of material discharged and the area covered. Markets range from agriculture to road maintenance. For more info, visit cat.com. This might be one of the ultimate niche attachments. Danuser’s Python Wire Winder connects to a customer’s existing hydraulic auger drive, with 2-in. hex connection. 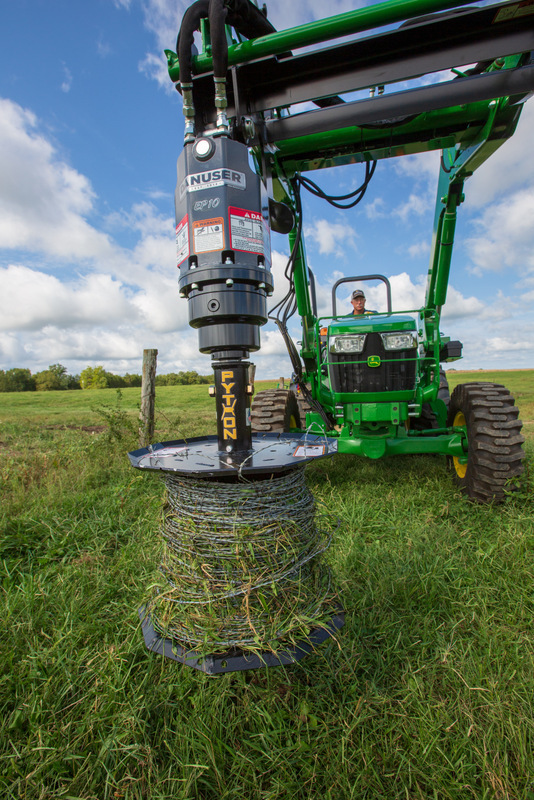 Once installed, operators can place the fence wire strands in the slots, push the spike into the ground and turn on the auger drive to start wrapping. Once the wire is wrapped up, it can be removed by pulling a pin and separating the two Python halves. The Python is designed to accept two tie wires to keep the wire neatly coiled up until it’s time to be reused. It holds up to three-quarter mile of barbed wire (12.5 gauge) or up to six miles of smooth wire (14 gauge). For more info, visit danuser.com. 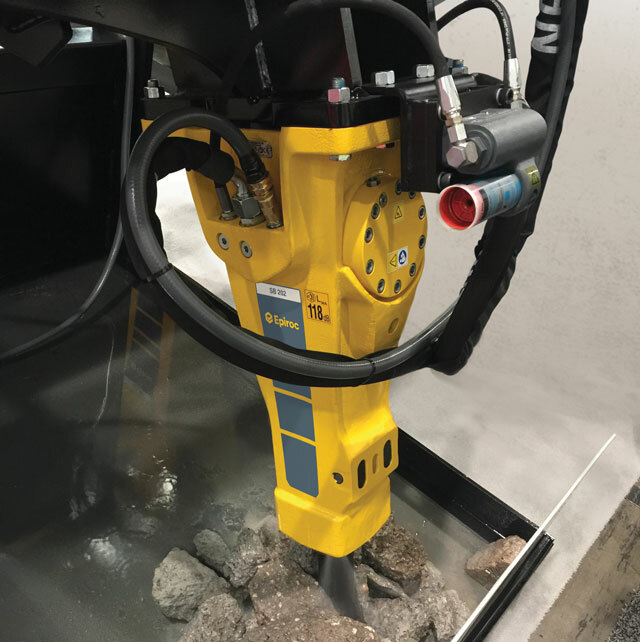 Epiroc’s SB Series hydraulic breaker attachments are the industry’s only breakers to come standard with an internal water port for dust suppression, a feature that can assist in compliance with the Occupational Safety and Health Administration’s silica rule dust regulations. With an integrated water channel, operators can spray water at the source of dust creation to keep dust levels down. SB breakers are also designed to protect operators and equipment by reducing noise and vibration. These SB Series breakers are engineered for the 0.7- to 24-ton carrier class and are used in everything from demolition to pile driving. For more info, visit epiroc.us. Excellent lifting capacities are one of the reasons the compact tool carrier market continues to grow. Attachment manufacturer Berlon Industries is helping those stand-on and walk-behind tool carriers move more logs and brush with its Mini Forestry Claw. Unload and transport debris up to 2,000 lbs. High visibility orange claws allow users to see what they’re grabbing in brush or limb piles. The claw features a 60-in. opening and is fully articulated, granting free movement without moving the machine. It comes complete with aggressive teeth, so you can help stabilize and secure logs when transporting. For more info, visit berlon.com. Skid steers and track loaders are designed for diversity. 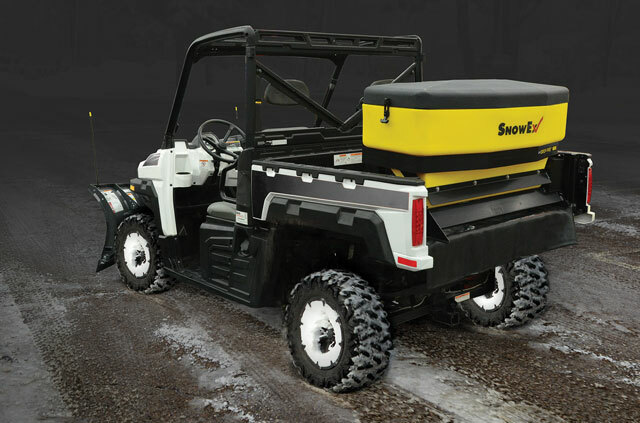 The new Fox VersaPlow attachment gives these tool carriers even more utility when it comes to snow removal applications. The VersaPlow combines the functions of a box-style containment pusher, a backdrag containment box and a conventional snowplow. 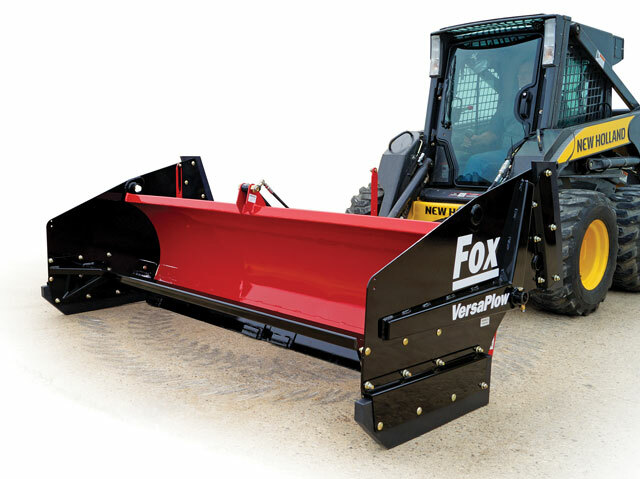 Designed for parking lots, apartments, municipal campuses and beyond, the Fox VersaPlow is available in 8- and 10-ft blade widths with a steel trip-edge or urethane resilient-edge. Advanced hydraulic controls even allow operators to change configurations without remounting. For more info, visit foxattachments.com. 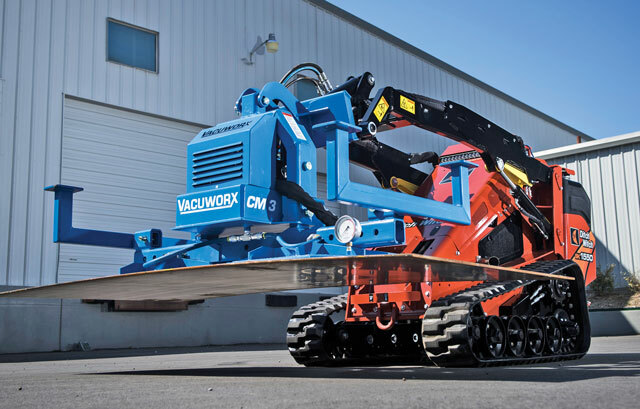 Vacuworx makes some of the coolest attachments in the industry. 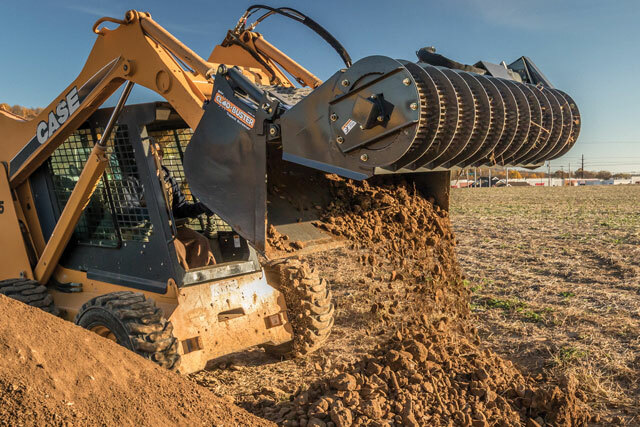 In April, the company announced a partnership with underground equipment expert Ditch Witch to design vacuum lifting attachments for its line of mini skid steers. The Vacuworx PS 1 Portable and SL 2 Subcompact Vacuum Lifting Systems are compatible with the full line of Ditch Witch mini skid steers (the SK600, SK800, SK1050 and SK1550). Using vacuum, the PS 1 can lift up to 1,700 lbs. The SL 2 can lift up to 2,700 lbs, and to get the most out of its lifting capabilities, the SL 2 should be used in tandem with the SK1550 unit. For more info, visit ditchwitch.com or vacuworx.com. We have even more attachments, just click the link!